Reserved until April 25 ? The last reservation of this item will conclude on April 25. For rentals that require shipping or a pickup at a non-headquarter location, please select a later date for your arrival. Headquarter offices are the only locations that can accept a same-day reservation, as transit time is not calculated in this date. 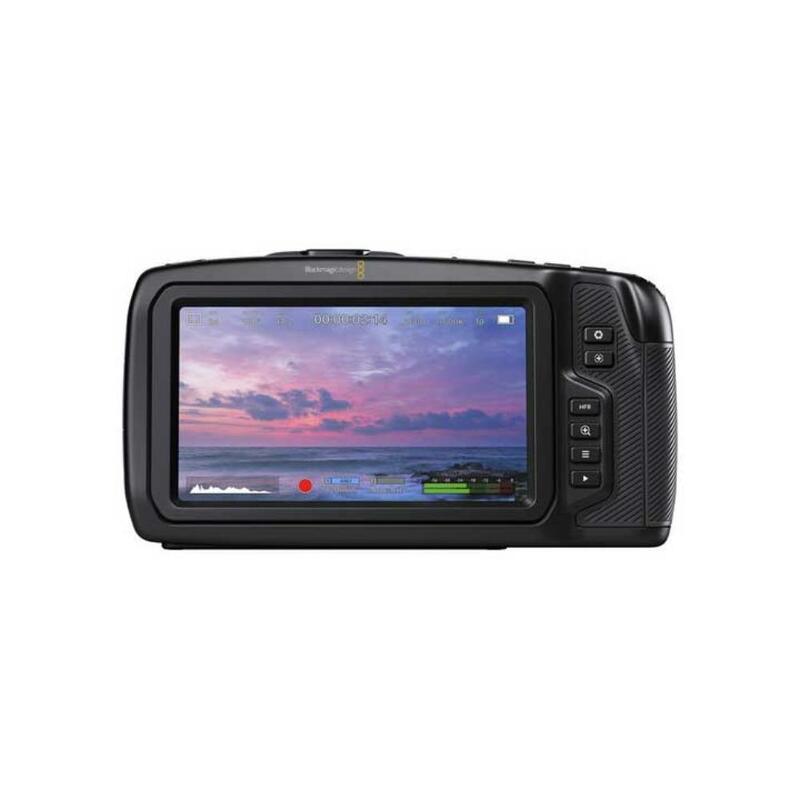 The Blackmagic Pocket Cinema Camera 4K is the much-anticipated update to the Blackmagic Pocket Cinema Camera. The original offered a unique set of video features in a very sleek and affordable package and Blackmagic expanded on this with the new version. Responding to the video prowess of competitors like Panasonic with their GH5S, Blackmagic has overhauled their unique pocket camera to keep up with the shooting demands of current videographers while maintaining vlogger-friendly functions. The new, wider Four Thirds sensor features 13 stops of dynamic range, Dual Native ISO, and can shoot uncompressed 12-bit Cinema DNG RAW over USB-C to an external drive or to one of two high-speed card slots (CFast 2.0 and UHS-II SD). All this without sacrificing an active, electronically-controlled Micro Four Thirds mount, allowing for a wide range of portable lens options. Sitting between the Film and Video modes is a new Extended Video Mode that preserves highlights and shadows while taking advantage of Blackmagic's color science for ready-to-use footage that needs little-to-no grading. 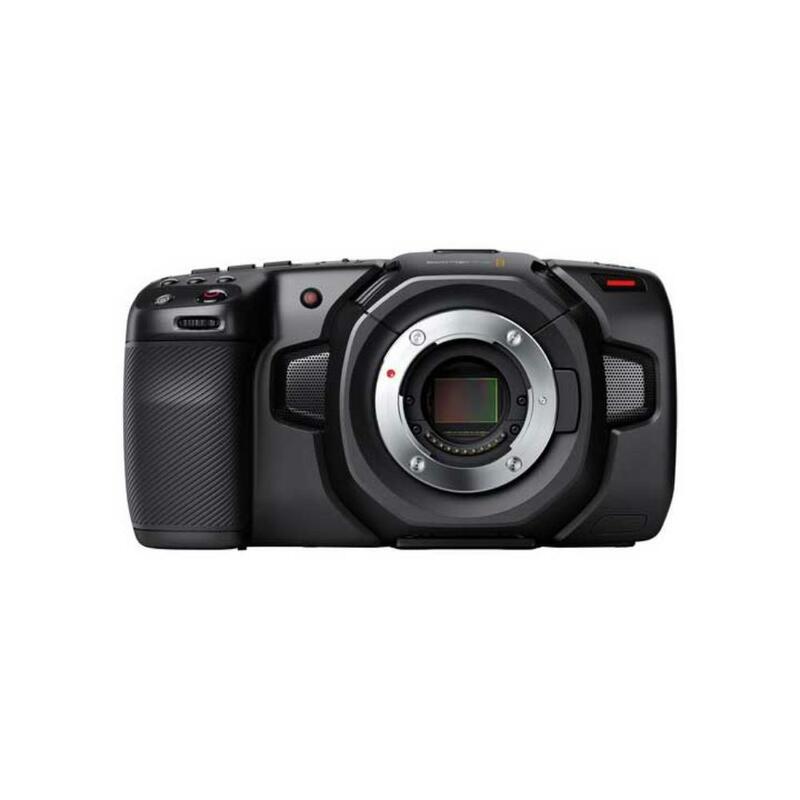 The highly-compact form factor is wrapped in carbon fiber, keeping the Blackmagic Pocket 4K durable and lightweight. Well-placed controls and a rubberized hand grip make it comfortable to use even over long periods of time. Equipped with the same OS as the URSA Mini, you can easily navigate settings and monitor footage on the huge 5" 1080p touchscreen. Audio options have been expanded. Capture great sound on location using the four built-in microphones situated on either side of the lens mount. To upgrade to external mics, you have a choice of a 3.5mm input or a mini-XLR socket with 48V phantom power. Among the ports you'll also find a full-size HDMI connector that's compatible with advanced features, like HDR or clean 10-bit out with on-screen overlays showing full camera status – ideal for use with optional external monitors. Power all of this with the convenient and common LP-E6 type battery. The USB-C Expansion Port accepts power from optional battery packs, allowing you to shoot all day. There is also a DC-in socket for pairing with optional broadcast-style batteries. An extremely quiet fan keeps the system cool, with air intakes placed at the top of the body so that the whole thing can be shot from the ground or mounted without any obstruction of cooling. 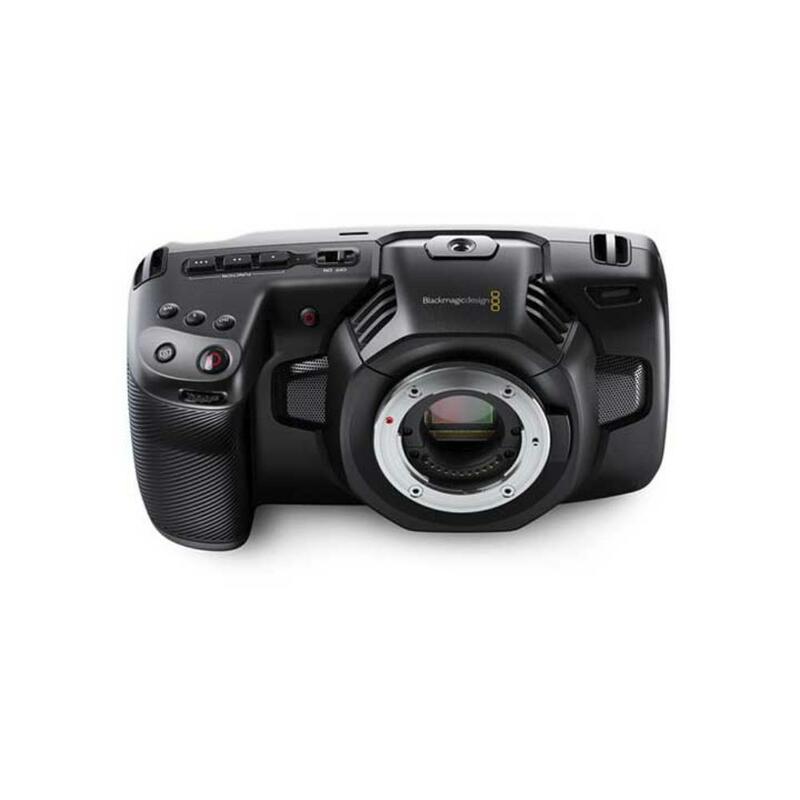 Blackmagic packed not only high-end specs into a very small camera but also maintained conveniences common to small systems. Thanks to a variety of front button features, as well as a forward-facing record button, YouTubers will feel right at home with this camera. Menus have been kept clutter-free, with everything laid out in an intuitive and easy-to-read way. The function buttons can be mapped to a variety of preferred settings. Excelling in flexibility, the Blackmagic Pocket Cinema Camera 4K is ideal for run-and-gun projects, documentary filmmaking, vloggers, and videography novices and experts alike. 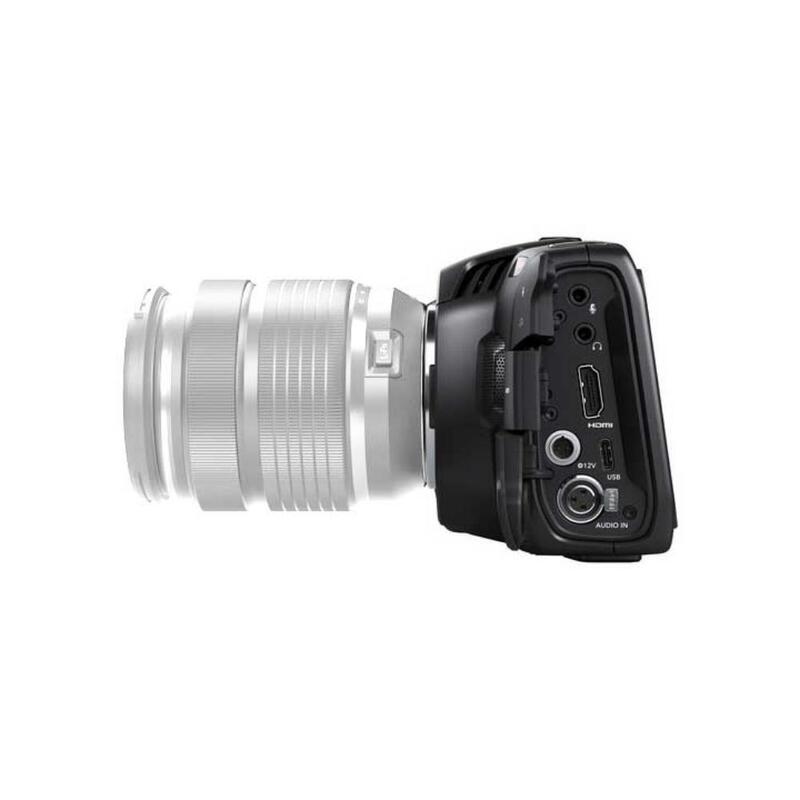 • This camera has an active Micro Four Thirds mount, which is compatible with camera-controlled iris adjustments. • We make every attempt to have a fully charged battery for you but we can’t guarantee it 100%. If you need a fully charged battery, please request it via the order notes. Batteries last for approximately 1 hour of continuous recording time. Renting spares is advised. Batteries take approximately 1 hour and 15 minutes to fully charge. • For a list of recommended cards and drives (which are not included), please see this chart.